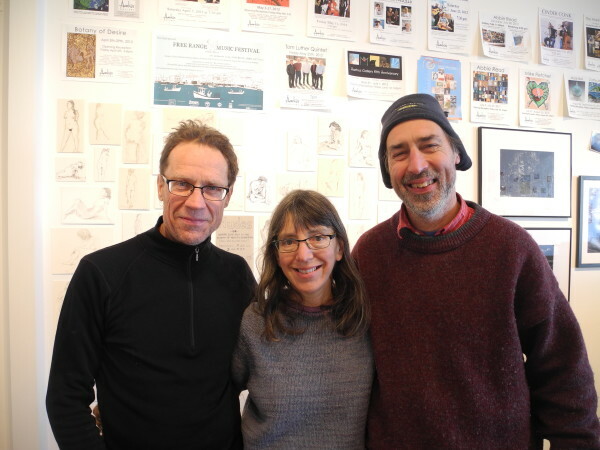 Artists Richard Mann, Willy Reddick and Wes Reddick, three of the four partners in Aarhus Gallery, were getting ready Thursday for the gallery's final event -- a farewell party put on by the community as a way to say thank you for the seven years of art and events. Willy Reddick, a partner-artist at Aarhus Gallery, was busy Thursday hanging art for the business's final event. BELFAST, Maine — One hundred and fifty colorful posters march around the tall white walls of the Aarhus Gallery in downtown Belfast, each bringing up memories of a different show, concert, play or event that took place there in the last seven years. On Friday, Jan. 9, the doors will reopen for the very last event there — a special farewell party called “Into the Black” intended to celebrate the artists who have owned and run the gallery and ideally lessen their financial burden as they close it down. News of the late-December closure of the gallery has hit patrons and the community hard. Belfast City Councilor and downtown businessman Mike Hurley said Aarhus — one of many art galleries in the city known for having more than its share of them — was more than just a place to go look at paintings on a wall. He said its closure will be a “tremendous loss” to Belfast’s reputation as an arts-centric community. Dave Johnson, who lives downtown and often has gone to the monthly art openings and other events, said Thursday he wanted to put on a party to thank Aarhus artists — Wes Reddick, Willy Reddick, Richard Mann and Mark Kelly — who are the current partner-owners. According to Breanna Pinkham Bebb, executive director of Our Town Belfast, Aarhus Gallery has been “one of the highlight galleries” in Belfast. The city will continue to have a vibrant arts scene, she added. But making a living at art is not easy, according to Willy Reddick, who was working to mount the very final art show Thursday. 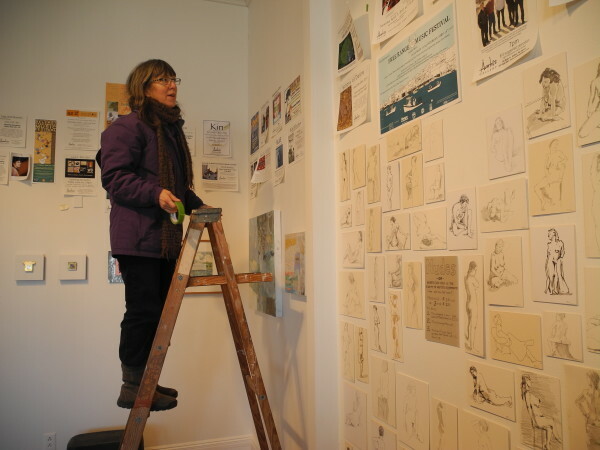 She said the last two months have been difficult, as she and the other three artists who are partners in owning the gallery needed to break the news to people in the community they would be closing their doors. She had been part of it since 2007, when Annadeene Fowler approached her asking whether she would be interested in opening a gallery in Belfast. That vision ended up taking root in the gallery space Fowler on lower Main Street, with the labor and talents of the other partner artists they found. They wanted it to be open year-round, to look fresh, to have it have “flow and excitement,” Reddick said. They wanted a craft section, with objects that were less pricey and more accessible to the community. They wanted to showcase the work of other artists and people in the community — the annual “Radius” show in March was open to anyone who lived within 30 miles of Belfast. Reddick said that despite successful shows like “Radius” and an increasing community presence, Aarhus was never a financially viable enterprise. Some days they would do $10 worth of business. Other days, they would sell one postcard and make just 95 cents. She and the other partner-artists said they are touched by the idea that the friends of the gallery would hold a farewell party for them. Each will show some of their own artwork in hopes of selling some pieces. The “Into the Black” farewell party for Aarhus Gallery will be held from 5 to 9 p.m. Friday, Jan. 9, at the gallery at 50 Main St. It will feature live music, food and drink.